The world is full of exotic destinations; people are constantly visiting many of the same cities where crowds can seem endless. Popular honeymoon locations don’t vary much – couples want perfect weather, clean beaches, pristine water and tropical cocktails. This is good news for adventurous travelers who are looking for something a little different because thrilling off the beaten path getaways offers just as many adrenaline-pumping activities, but minus the masses. Many under the radar destinations boast lively biking, hiking or diving cultures because of diverse geography and wildlife. You don’t have to be in Reykjavik to see breathtakingly beautiful geysers and craters. 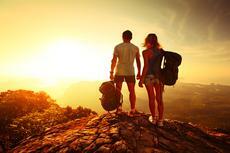 How many of you have thought of climbing Mount Kilimanjaro during your honeymoon? You may even be surprised to know that some couples even choose to say “I do” at the top. Hiking an active volcano, horseback riding though rugged terrain, staying in glass igloos, and going on a safari to see some of the few remaining gorillas in the world are just some of the romantic activities adventurous couple would love.